Best places to go Bait fishing is Sevengates, Anglers Reach, Rushes, Best Bait Scrubworms. "good tip try the worms under a Bubble float ". We have had some good reports in the Eucumbene and Thredbo with Nymphs being the standout patterns. Glow Bugs will be worth using here too. There has been some good reports off fish moving up both rivers Eucumbene and Thredbo the best areas I found is around the ski tube up and down from the railroad bridge plenty of fish and from the Thredbo bridge up is worth a look.. Eucumbene from providence down most fish have been active late in the afternoon at night in the river black woolly buggers have been working well. So when the rain does come there will be plenty of action in both rivers but at the moment look and get down the fish are very spooky good luck. 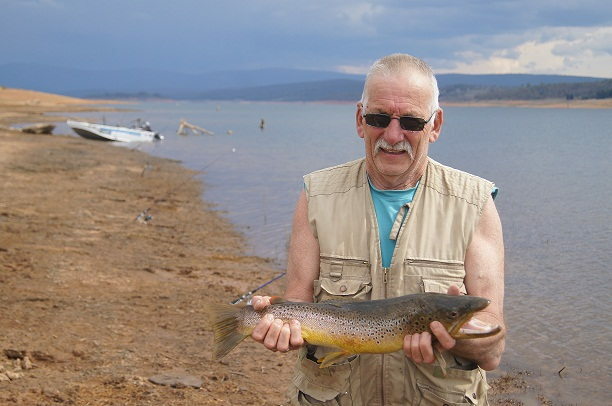 Don’t forget the Snowy river that runs into the Island bend dam starts fishing well around this time off year. Hi guys, just thought I'd drop in a picture of a great jack brown I picked up tailing with a #12 shaving brush on the bidgee. Got pretty wet landing him but it was worth it. Fly reports have varied over the past week. Daytime fishing has generally been the best with the evenings and night time fishing a little slow. Bead head nymphs and woolly buggers fished slow and deep have been the best fish takers of late. There have been some nice rainbows being caught for those who put a bit of time in. There has been some good Browns around Buckenderra Rushes and Middling bank seven gates Woolly buggers have been working well and black B/H Nymphs are keeping the big fish interested. 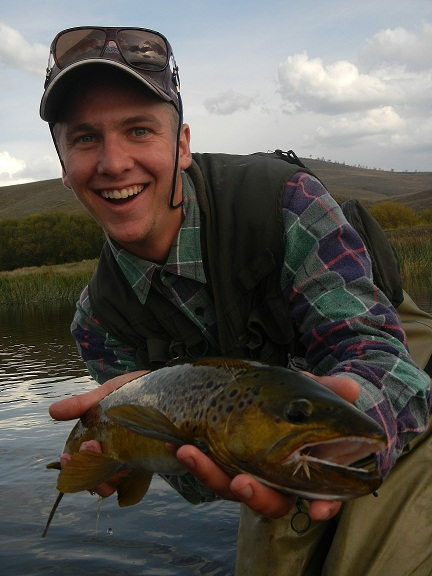 We have been getting good reports on the fly with intermediate and sinking lines have been doing well. Yes the reports have been slow and fisherman not doing so good so change what you are doing and get down to where the fish are you will find the results a lot better on a sinking line. Best areas have been Seven Gates, Buckenderra and Rushes Plains, with some fish also at Braemar, the dam wall and Anglers Reach. Lake Jindabyne:- Reports from Jindabyne have been scarce but evening and early morning should be a good time to find a few patrolling the edges. Stick Caddis, Olive Nymphs, Black Nymphs, Craig’s Nighttimes, Muddler Minnows, Scotch Poacher, Fuzzy Wuzzy's and Matukas are the patterns of choice at the moment. The quality of some of the fish has been superb with real football like condition. Best spots to troll have been Sids Bay, Creel Bay, Kangaroo Bay, the bank between Sid's and Kalkite and close to the township. Hey guy's,me,my dad Col,Gaz and Dan and Sam fished cemetery Point for a night.Water was very low and dad managed one nice brown caught on a grub late afternoon.It was very quiet after that,with a lot of rain.Saw some young guys leave a heap of rubbish behind,the inconsiderate grubs! !